There may be instances where your internet connection will be unstable. This will show you how to use Deputy offline in these instances. Note: The Android Time Clock currently does not support Offline Mode. To use the iPad Kiosk, you will need to have an iPad capable of running iOS 8 and with a forward mounted camera. To set up the Kiosk, you will need to be either a location manager or system administrator. If you have not yet set up your Kiosk, please follow the instructions here. Please note that you must be online to set up the Kiosk. To use the smartphone app offline, you will first need to download the app and log in with your user name and password. The smartphone app is available on iPhone and Android devices only. The web version of Deputy is fully online, meaning that you won't be able to access or change it without an internet connection. The Kiosk for iPad can be used anywhere, as long as you have set it up beforehand. If you are unsure as to whether or not your Kiosk is currently offline, you can check by logging in and looking beneath your profile picture. If the Kiosk is offline, you will see a "Kiosk Offline" message as shown below. While the Kiosk is offline, you will only be able to view information that was present when the connection was lost. This means that you may not view new announcements, tasks and shifts. You can however make announcements on the Kiosk and send tasks to other employees on the same Kiosk. This means that your team will be able to communicate with each other while on shift, but not with the greater organisation. Some features of the Kiosk are restricted while it is offline. You may not enter a leave request, unavailability, access the calendar, or add a new employee; each of these actions requires an internet connection to upload the information. While the Kiosk is offline, you may still start and end your shift as usual. Although the Kiosk may read offline as shown above, you will still be able to start both scheduled and unscheduled shifts. To do so, please start your shift as you usually would. If you have not used the Kiosk before, this article will explain. Please note that the Kiosk should be intermittently connected to the internet so that it can upload your shifts. While the Kiosk can run for a few days without it, we recommend going no longer than 24 hours without an internet connection to ensure the best retention of data. The offline version of the Deputy app features read-only capability for data downloaded while online. 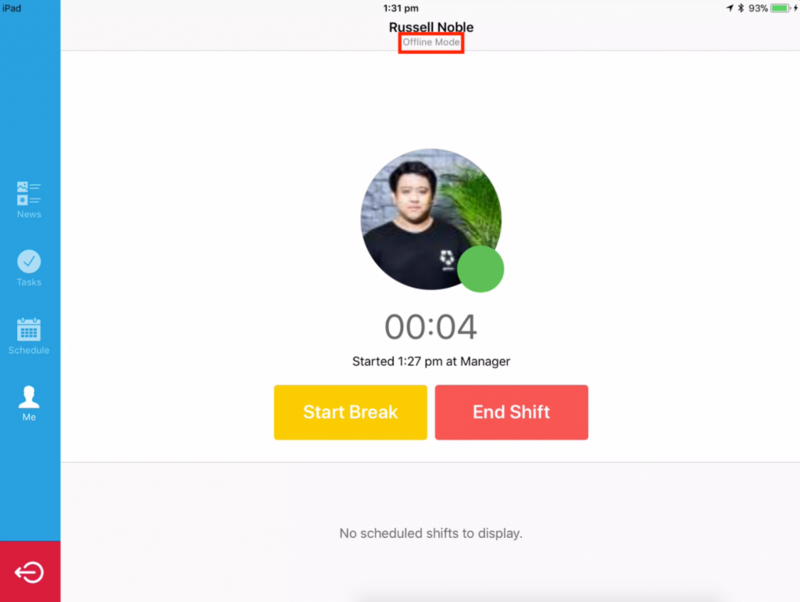 This means that if you downloaded your shifts, announcements and tasks when you were online, you will be able to read them by bringing up the app on your phone. While you are offline, you may not create new tasks, timesheets, schedules, or announcements. 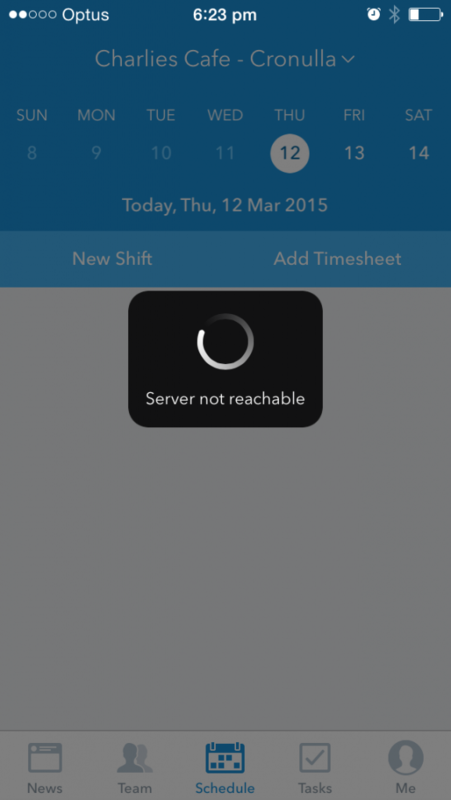 Attempting to access online data or create new data will result in a warning being displayed that reads "Server not reachable", as shown below on the iOS app. Reconnecting to the internet will allow you to download new data. If you are working or living in an area with minimal available internet, please be aware that you will only need to be connected for a few seconds to upload or download new data. If you have a poor connection, try moving your phone near a window or on higher ground.